Open from 9.30 to 17.30 from mid-July to the end of September. Open from 10.00 to 17.30 all other times of the year. The latest admission is at 16.15. Skip the line entry is between 15.00 and 16.15. This attraction is open all year round. We are comparing The Queens Gallery Buckingham Palace Prices from leading ticket suppliers and Try to find you Cheap tickets prices on the market. Opened in 2002 to celebrate the Golden Jubilee of Queen Elizabeth II, the Queens Galley hosts an abundance of treasures inside the beautiful Buckingham Palace. On a visit to the Victorian age building you can expect to see an array of hand-carved French and English Furniture and a series of exotic trees and plants in the finely kept gardens. The museum also hosts a selection of painting from the likes of Rubens, Rembrandt, and Poussin, as well as a portrait of King Charles II on the day of his coronation. The gallery also houses historical artefacts from the Monarchy’s history such as the wedding dress worn by the Duchess of Cambridge in 2011 on her marriage to Prince William. After visiting the Queens Gallery don’t miss the chance to watch the spectacular changing of the Guards outside the Palace doors. A visit to the primary residence of the Queen of England is a must for anyone visiting London. The Queens Gallery will particularly appeal to visitors with a strong interest in history or for people who want to learn about the history of British Monarchs. Art lovers can also admire the fine paintings on display inside the museum. Kids will be entertained by the free multimedia guide. The attraction is appropriate for visitors of all ages and accessible to disables visitors. Your Experience With The Queens Gallery Buckingham Palace? Get an insight into the life and history of the Royal Family with a self-guided tour of the Queens Gallery. Learn about former British Monarchs and the current Royal Family from your complimentary multimedia guide. See beautiful paintings, sculptures and other artworks from the Royal Family’s private collection. Walk through this iconic building and soak up the British architecture and grandeur. What The Queens Gallery Buckingham Palace Includes? Multimedia guide (available in English). We recommend that you avoid visiting the gallery on bank holidays or public holidays when it will be more crowded. Travelers Reviews about The Queens Gallery Buckingham Palace? 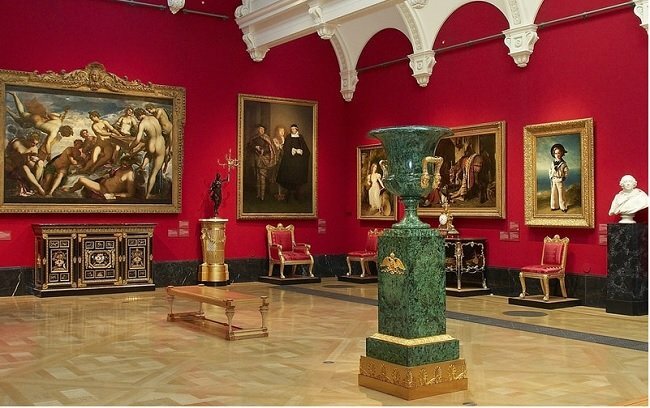 The visit to the Queens Gallery has been highly recommended by visitors of leading travel platforms. On TripAdvisor the attraction has earnt an average score or 4 out of 5, while on Tiqets the tour has a 4.5 out of 5- star rating. Visitors have described the gallery as informative and well organised. They have also said that the pre-booked ticket makes entering the museum very easy. Travellers generally agree that this is a fantastic way to see a bit of Bucking Palace. The Queens Gallery in Buckingham Palace is fully wheelchair accessible (the building is fitted with a lift). You will receive your ticket confirmation via email. Your voucher will be accepted in electronic or printed form. Refunds are not possible for this ticket, you will be charged the full ticket price for any cancellations regardless of when they are made. The Queen’s Gallery will be completely closed on certain dates (including 25 and 26 December) due to special events. You can check the Queen’s Gallery website to confirm which dates the attraction will be closed. There will be security checks at the entrance to Buckingham Palace, this may cause short delays. Please do not bring any sharp items, suitcases, or large bags. Photography is permitted inside the Queens Gallery. No foods or drinks are permitted inside the Queens Gallery. At busy times pushchairs will need to the left in the onsite cloakroom. Baby changing facilities are on site. Address: Buckingham Palace, London SW1A 1AA. Bus: take lines C1, C10, 11, or 211 to Buckingham Palace Road. Underground: the nearest stations are Green Park, Hyde Park, or Victoria.